This article is about the commercial software. For the game concept, see adventure. The Adventure, also known by the longer title The Adventure: Only the Fittest Shall Survive or The Adventurer Series, is a commercial variant of Eamon released for the Apple II by Green Valley Publishing under its Load'n'Go Software label. The last known version is Version 3.5, released in November 1985, although The Adventure continued to be advertised as late as May 1986. During the height of Eamon popularity, the public domain nature of the game ensured a number of vehicles for acquiring Eamon and its adventures existed. One could go through local Apple computer clubs such as the Big Red Apple Club, purchase disks through a public domain distributor like 3A, or make purchases from the National Eamon User's Club. Aside from disk copying fees, the software itself was free. Donald Brown expressly permitted non-commercial distribution of Eamon and, when he sought to monetize his creation, opted to create a new system SwordThrust drawing inspiration from his public domain creation rather than plundering it outright. Rather than recreating the wheel, Load'n'Go chose to steal Brown's Eamon, removing every trace of its history or authorship. For example, Brown's name appears nowhere on the Beginner's Cave disk. 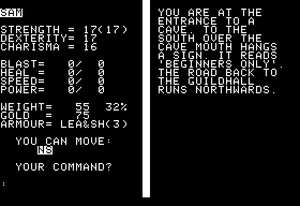 The primary gameplay difference between Eamon and The Adventure is that the latter employs a split screen technique, with half of the screen tasked with describing the present room, monsters, and artifacts and the other half devoted to the player's statistics and inventory. With 50% of the space to describe items, a fundamental difference is that the descriptions for monsters and artifacts are absent in the game (although those for rooms are retained). As noted above, the descriptions of monsters and artifacts are omitted from The Adventure disks. 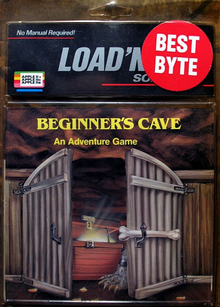 In the variant of The Beginners Cave distributed alongside the Master the monsters, artifacts, and map are identical to the version authored by Brown. The room descriptions, however, are altered to some degree, renaming some rooms as the "Hall of the Great Lord Gumby" and "Hall of the Great Lord Galootie." Moreover, one chamber has graffiti scratched into the wall reading, "Gumby hath no mercy." The adventure has no opening or closing text and the Lords Gumby and Galootie do not appear as monsters; the meaning of these alterations is hence obscure.